Let those other girls in her class dress like pop stars and princesses this Halloween—your little gal is a fighter of freedom and justice! She has been politically active since before she could walk, and never, EVER, misses a chance to vote in a school election. Lately, she's been reading up on the women's movement, and the brave ladies that paved the path to greater (though by no means equal) rights for women. It should come as no shock to you, then, that the moment she laid eyes on this costume, she cast her ballot in favor of its strength of character and important message. The fact that she can also use it to help educate her peers or rally the houses that she trick-or-treats at, well, that's just icing on the proverbial cake. And if anyone tries to give her a hard time in this outfit, we know your sharp and sassy daughter will stand up for her right to embody an entire movement in this Girl's American Suffragette Costume! Just look at this little lady! She's dressed to fight for the cause. In this costume, she's perfectly decked out in the style of the times, including authentic details like a Peter Pan collar, wide green waistband, and floor-length, simple skirt. 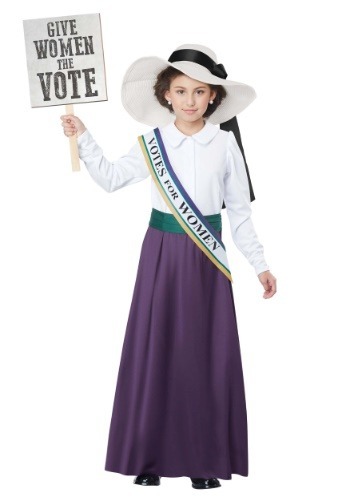 Her bold sash reads "Votes For Women" and the wide brim hat draws attention to the historical nature of her costume. Give this girl a sign, or one of those old-timey, lo-tech megaphones and let her spread her message to the world! The suffragettes would be proud of your little girl, keeping their fight alive so many years later. It's a tough world out there, but we think your politically-minded girl is the future, and we've gotta say, the future looks bright!